Phnom Chiso is located in Sla commune, Samrong district, Takeo province. The Phnom Chiso temple was built during three consecutive reigns before it was finally completed: its construction was started by King Suryavarman I between 1002 and 1045, followed by King Tharninvarman I between 1107 and 1113, and the last king who completed this temple was King Suryavarman II (the builder of Angkor Wat) between 1113 and 1145. When he heard these strange blessings, the king became very angry with the old Brahman, however the old man gave his explanation to the king by undertaking three experiments to convince the king. According to Book No. 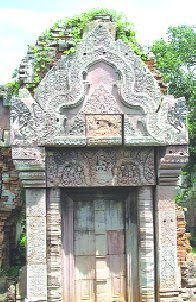 1 of the Khmer legends collected by Dr Michel Tranet, a Cambodian historian, about the history of Khmer temples, Dr. Tranet indicated that, for the first blessing, the Brahman ordered that a piece of steel the size of a human being be brought forward. The steel piece was about the same size and height of a human being, he then ordered a man to lift this piece of steel, but the man could not. He then ordered that a steel needle be cut to the size of an ant, and he dipped the piece of needle in honey and left it near an ant which carried it away. For the second blessing about being as powerful as a ghost, he ordered that 7 dead bodies be buried next to each other in a desolated mount. One of the dead body was that of a woman who died while giving birth, another body from a person who died from snake bite, another one who died by a buffalo horn attack, another one died from lightning strike, another died from being hacked to death, another one who died from drowning, and another person who died from hanging himself. The 7 bodies were buried far away from any village, and 7 precious silver bowls were also buried next the head of each of the dead persons, next to each grave, offerings and white cloth will be left there as well. He then ordered daring people to go dig out the silver the bowl to keep for themselves during the middle of the night while candle sticks are burnt at each grave. During that time, no soldiers dared to go dig out the silver bowls, that was why the Brahman wished the prince to be as powerful as a ghost. For the third blessing, the Brahman called in a poor man and told him in secret that if he was willing to kill his wife, he will given a high ranking position. The poor man refused to do so. Next, the Brahman called in the man’s wife and told her in secret that if she was willing to kill her husband, she would receive a lot of gold and silver as reward. After thinking about it overnight, the woman came back and replied that she was willing to do it. There it was! The wife was audacious enough to kill her husband. That was why the Brahman wished the young prince to be as audacious as a woman. Upon learning all these facts from the Brahman, the king nominated him as the top erudite in the kingdom and he wished the Brahman to have all his wishes fulfilled in life. He further made the Brahman the teacher for the prince from then on. In the legend told by the villagers, there are some details that are added or removed to illustrate the words etched on the stone inscription so that they could be easily understood by anybody.